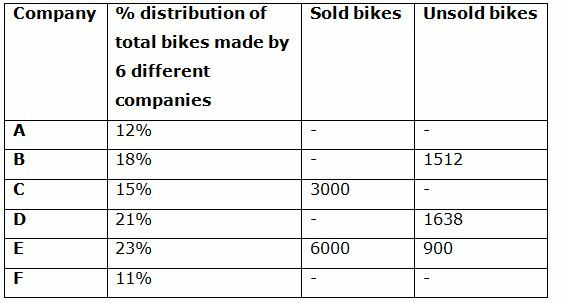 The following table shows the percentage distribution of total number of bikes made by 6 different companies in a certain year and the number of sold and unsold bike also given. Some values are missing here. Note: Total number of bikes made by all the given companies are either sold or unsold by the respective companies. 7. Find the percentage of bikes sold by company B? 8. Find the average number of bikes unsold by the company A, C and E together, if the percentage of bikes sold by the company A is 85 %? 9. Find the sum of the total number of bikes sold by the company B, D and F together, if the total number of unsold bikes in company F is 1155? 10. Total number of bikes sold by company C, D and E together is approximately what percentage of total number of bikes made by the company A, B and F together? 7) Find the percentage of bikes sold by company B? 8) Find the average number of bikes unsold by the company A, C and E together, if the percentage of bikes sold by the company A is 85 %? 9) Find the sum of the total number of bikes sold by the company B, D and F together, if the total number of unsold bikes in company F is 1155? 10) Total number of bikes sold by company C, D and E together is approximately what percentage of total number of bikes made by the company A, B and F together?